Sister Thea Bowman was born December 29, 1937, in the small rural town of Canton in Central Mississippi. Her grandfather was a slave; her father was a physician and her mother, a teacher. Thea was reared as a Methodist until at age nine when she asked her parents if she could become a Catholic. At the age of fifteen, she joined the Franciscan Sisters of Perpetual Adoration. In 1965, Sr. Bowman received a B.A. in English, Speech and Drama from Viterbo College in La Crosse, Wisconsin. In 1969, she received an M.A. 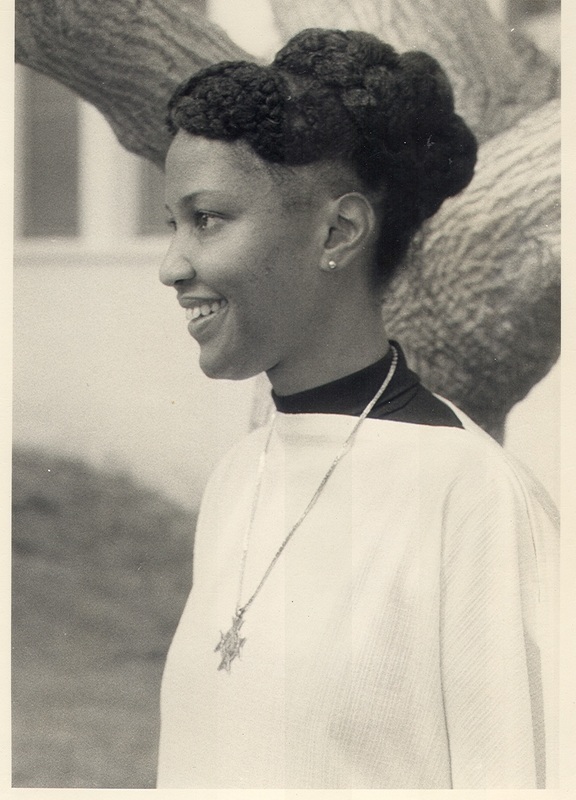 in English and in 1972, a Ph.D. in English Language, Literature, and Linguistics, both degrees from The Catholic University of America in Washington, D.C. She was the first black woman to receive a doctorate in Theology from Boston College. Gifted with a brilliant mind, beautiful voice and a dynamic personality, Sr. Thea shared the message of God's love through a teaching career. After 16 years of teaching, at the elementary, secondary and university level, the bishop of Jackson, Miss., invited her to become the consultant for intercultural awareness. In that position, Sister Thea frequently worked with children to help them grow in awareness of their gifts and of their cultural heritage. Through song, dance, poetry, drama and story, she communicated joy, freedom and pride, using traditional Black teaching techniques that were holistic, participatory and reality focused. Sister Thea made more than 100 public appearances each year, giving lectures, recitals, short courses, workshops, and conference presentations, spreading the message that people are gifted. In Nigeria, Kenya, Canada, the Virgin Islands, Hawaii, New York to Florida, Mississippi to California, Louisiana to Illinois, thousands of people worked with Sister Thea. She made doers of watchers, made people more aware of their own gifts and potentials, and put races in touch with one another. Her ministry was a ministry of joy. We should not be surprised that Thea's spirit continues to blossom in those who knew and loved her and in numerous programs of care initiated in her name. Many clinics and schools have been named for her. As recently as March 13, 1998, an editorial in the National Catholic Reporter recalled Thea's appearance before the American bishops at their spring meeting the year before her death. Calling her a prophet, the editorial noted the irony of her being "prohibited by church law from preaching in church," yet she "preached up an earthy, elegant storm." Thea did not see herself as a writer, and the power of her personal presence obscured her accomplishments as one. Nonetheless, she left behind a significant corpus of written works including such pieces as "Black History and Culture," and "Forged by Our History: A Cultural Perspective." The extensive, scholarly introduction to Lead Me, Guide Me: The African American Catholic Hymnal recalls the history of African American sacred music. When planning her funeral, Thea requested that someone read from the writings of Sojourner Truth. Thea Bowman spent her lifetime building the Kingdom of God, preaching the Good News in the language of her people, and reclaiming the virtues and values that were her inheritance.